Are you considering adopting a cat? Has it been awhile since you did this? Or do you just like cats and/or think I can make you laugh? Well then, read on. 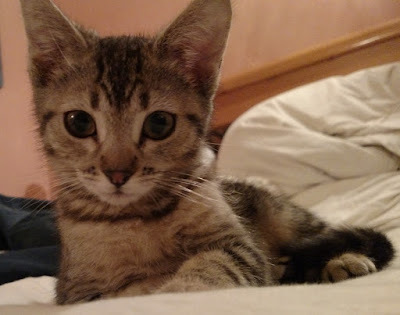 I adopted a kitten recently and have a few tips to offer. I like to adopt from the pound, the shelter, the Humane Society … whatever they call the local clearing house for unwanted or otherwise stray pets. Not only is this (almost) free, but procuring your cat at such a place gives you a bit of the do-gooder feeling, which in my case assuages the guilt I carry around about not donating more money to charity, not volunteering, etc. I can only speak for California, but since the last time I adopted a cat—15 years ago—laws have cropped up that significantly change the pound/shelter animal adoption experience. Animals are now required to be healthy, spayed/neutered, and have all their vaccinations. I suspect this changes the general level of care they’re getting, because last time, it was a grim scene. When I got my last cat 15 years ago, the animals at the pound seemed really stressed because there were miserable dogs howling at all times. There was almost an underground, black-market feel to the whole thing. I spied a little kitten who looked cute; my wife said, “Fine, grab her, let’s get out of here,” and we went to the counter. “I found a kitten I like,” I told the guy. He glared at me and said, “There are lots of kittens I like here.” Abashed, I replied, “Let me rephrase that. I found a kitten I like so much, I want to take her home.” He said, “That’s more like it.” I forked over like $50, he put the kitten in a box, and we left. We were in there for maybe five minutes. Though that was inarguably convenient, that original kitten ended up being really sick. She had worms, ear mites, an eye infection, and a nasal infection. She refused to eat for days, until I figured out that she couldn’t smell her food and didn’t know what it was. When I shoved her snout into the bowl, she was like, “Oh, wow, food! And just in time—I’m starving!” One expensive trip to the vet and several prescriptions later, she was healthy as a horse. Probably healthier. Though we never knew her birthdate, she lived for about fifteen years. Rest her soul. The pound’s website isn’t perfect. First of all, the kitten we thought we wanted—because she looked the cutest in the photos—didn’t end up having a tail. I’m not saying this was a bait-and-switch, just that the photos didn’t happen to capture that characteristic. I prefer a cat with a tail. That doesn’t make me a bad person, does it? Surely somebody will want the adorable Manx kitten. Anyway, the other shortcoming of the website was that there were lots more kittens at the pound than were represented on the website. I think these shelters are almost always on a shoestring budget. They’re no Amazon. Our pound has some weird “adoption hours.” They’re closed most days, and don’t open until 11 a.m. Maybe their idea is to make sure no deadbeats try to adopt. If you can manage to show up at the right time, you’re obviously fairly organized. Maybe you’ll remember to change the litter box. Another hurdle was their pre-adoption questionnaire. My brother had warned me about this. Perhaps the current generation is so often asked to participate in focus groups and such, their guard is down and they think companies are just curious about their buying habits—but make no mistake about it, the pre-adoption questionnaire is more like an application. I suspect that if you answer wrong, they can disqualify you from adopting, just like with humans. The various documents we were given mentioned a microchip. I’d heard of this before. I consider it one of those options, pet insurance being another, that I would eschew. But when we went through our pet adoption tutorial, given by a staffer, we learned that the microchip is not optional. These are implanted in every animal as a matter of course. Our kitten already has one. 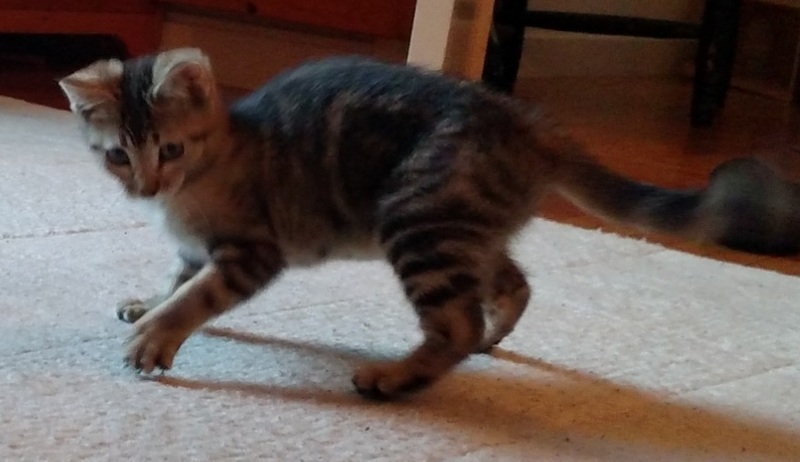 I actually find the idea of the microchip a bit creepy, and I have to wonder whether the company that maintains this system will actually delete my kitten’s info from the database when I refuse to pay the ongoing, lifelong registration fee. That would be kind of mean. The staffer asked us, “Have you owned a cat before?” Was this another trick question? I think the perfect response would have been, “If you’re asking whether we’ve been the human guardians of a companion animal previously, why then, yes, we have.” These are the terms that the City of Berkeley officially adopted years ago in favor of those hopelessly outdated and thoughtless terms, “owner” and “pet.” But before I could decide how to respond, my wife and kids said, “Yes!” and the tutorial continued. Whew! The staffer recommended we keep the kitten in the bathroom for the first couple of days, lest she become overwhelmed. We certainly hadn’t done this with our previous kitten, who was given full run of the place right off—not that she took advantage of it. The whole first day she’d hid under a bed, and on the second day, when we saw her walking around—“On all four legs, just like a cat!” I blurted out stupidly—we were filled with a strange sense of pride. Anyway, we were quick to agree with this bathroom strategy, but I felt I should come clean about something: because our house has only one bathroom, it’s like Grand Central Station in there. But before I could say this, the staffer said, “It’s good with all the coming and going because the kitten can gradually get to know you.” Fair enough, though with the smells we humans make in there, I don’t see how this is putting our best foot forward. One other question that caught me off-guard was, “Do you think it’s a good idea to touch a kitten’s face and ears, which she might not like, right off the bat?” Given the advice about sequestering the kitten, I figured the answer was “no.” But my kids blurted out, “Sure, why not?” (thus proving they had ignored my earlier lecture about not getting up in the new kitty’s business). The staffer said, “Right! Go ahead! Do touch her face and her ears, because she needs to get conditioned to it right away. This will make her more comfortable with it for her whole life, and makes trips to the vet easier.” Who knew? Something I really hadn’t anticipated is that all the animals at the shelter come pre-named now. Maybe this is just to keep them straight on the website (since using numbers would seem so bureaucratic and institutional). Or maybe focus group studies have found that it’s easier to fall in love with an animal, or at least harder to resist adopting that animal, when he or she has a name. “Our” kitty’s shelter name was “Jasmine.” But we’re not going to stick with that name. It doesn’t really fit. The jasmine shrub is native to Eurasia, Australasia, and Oceania, so this name would be more suitable for a Siamese cat, I think, than for “our” kitten, who is a Tabby, which I associate with Africa. Then it dawned on me how silly this rule is. After all, my wife and I had both our daughters’ names picked out in advance. To do otherwise just isn’t practical, because a baby’s personality can take a while to come out. For the first couple weeks, babies are just these crazy sucking, crying, and sleeping machines. Maybe newborn kittens are, too. I wouldn’t know … “our” new kitten is almost three months old.